Thursday´s signature line of hair care innovations help extend the salon experience into your own home. Our custom formulated products include a Conditioning Collection, Styling Collection, Styling Volumizers, Soy Protein Shampoo & Conditioner, Tea Tree Shampoo & Conditioner, and Color Retention Shampoo. The HLCC Scripts™ line of products help promote new hair growth. Also available for purchase is a selection of Image Skincare products that rejuvenate and refresh skin with highly potent anti-oxidants and organic ingredients without the use of chemicals, acids or paraben. 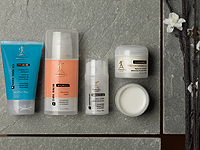 This conditioning collection offers a fusion of deep treatment and finishing products. Whether you want to improve overall manageability of hair, increase shine, or rejuvenate and rebuild damaged hair, these products will add luster and UV protection to any hair type. This collection of advanced hair styling products can be used to create a variety of looks. Whether you seek texture, definition, shape or soft hold these products will add luster and UV filtering to any style. These volume boosting products are formulated to provide natural looking styles and finishing looks. A unique blend of botanical extracts create volume, shape and shine without flaking or stiffness, delivering maximum styling results. This effective cleansing and conditioning set helps soothe and moisturize without adding weight to the hair’s surface. Essential nutrients restore and re-balance the pH level of hair leaving it smooth and stress-free with a healthy luster. Maximum benefits are achieved when Soy Protein Shampoo and Conditioner are used in tandem. Specially formulated to preserve color and prevent fading by filtering out the sun’s damaging rays, this shampoo helps to preserve the rich hues and vibrancy of salon color. A blend of Aloe and essential botanicals restore moisture and help keep hair healthy and strong. This cleansing and conditioning duo is specially formulated to invigorate and strengthen dry, treated or overdone hair. Pure Peppermint Oil and Tea Tree Oil impart a cool, invigorating feeling. Best results are achieved when products are used in tandem. Help keep your color vibrant. This shampoo and conditioner provides UVA and UVB hair protection to help prevent color from fading. Gently cleanses away dulling residue as it renews moisture and helps protect hair fiber strength. Keeps hair color brilliant with long lasting shine. Made especially for our hair systems, this shampoo smoothes and restores hair with Argan Oil, Keratin and Collagen. The conditioner helps to reduce frizz and seal in moisture with Argan Oil, Keratin and Collagen. The HLCC™ Scripts system of products are prepared blending all naturally-derived materials and do not contain any harsh synthetic material. There are no waxes or “film forming” ingredients. When HLCC™ Scripts products are combined with laser hair rejuvenation therapy you are providing the best possible environment to prevent further hair loss and promote new hair growth. An effective product line for preventing and treating the signs of aging and environmental exposures. Promotes skin rejuvenation and leaves skin fresh and youthful. All Image Skincare products are manufactured in the USA and are unparalleled in their quality in today’s marketplace.